Terry McCusker was a drummer who twice toured with Slade in the 1970's... In 1973 he played with Colonel Bagshot - who supported Slade on their European tour, and in 1975 he played with Bunny - who supported Slade on their UK Tour. Can you give me some background as to how you came to play drums and what bands you were in? Also, what are you doing now Terry? When I left school my first job just happened to be in the same building as the Cavern. Of course I used to go down there for the lunchtime sessions which featured the Beatles and Gerry and the Pacemakers. I always wanted to play the drums anyway, but those days really sparked my ambition to become a drummer. There was plenty of gigs around for bands then so I was soon playing seven or eight a week, and earning money at the same time! I am still playing (at the moment with six bands), so don't have a lot of time. Next week I am recording an album with someone who is singing French songs. 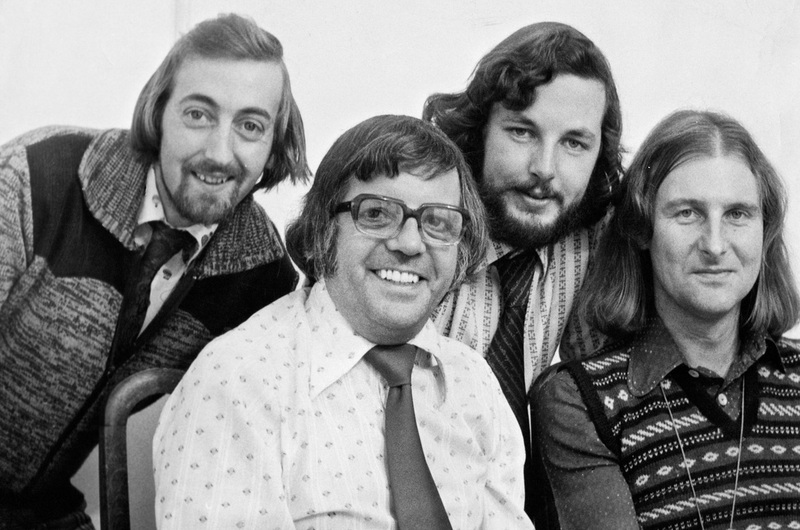 Your band Colonel Bagshot had some success with the album ‘Oh what a lovely war’ in 1971. 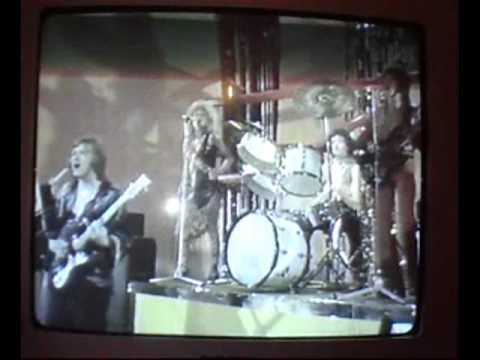 How did it come about that you supported Slade on their 1973 European Tour? The album didn't have much success at first, but 30 years later one of the tracks (Six Days) was used in the film Phone Booth on the play out. Since then it has featured in the Fast and Furious series of films. Also in Top Gear etc. 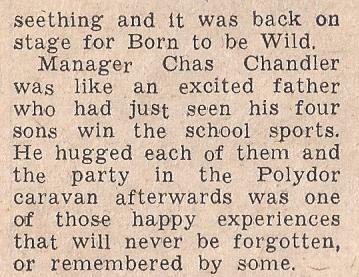 I think Tony Bramwell spotted us playing in London and told Chas Chandler about us. 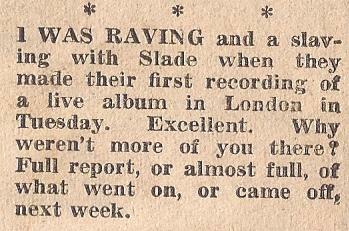 What did you think of Slade before your toured with them? Did you like their music? Had you met them before? 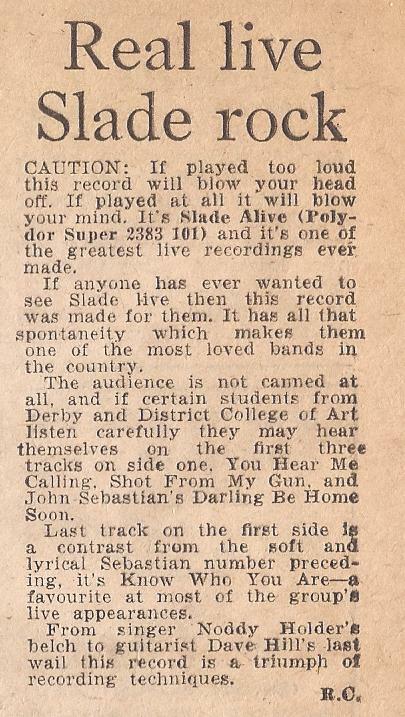 We thought Slade were terrific (still do) and we played with them in Quaintways in Chester when they were still Ambrose Slade - they were good that night I distinctly remember. Were you nervous about supporting Slade? 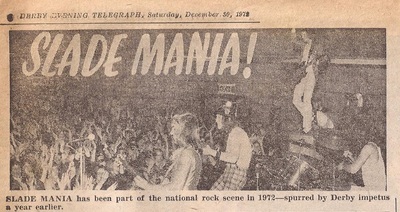 Previously the Sensational Alex Harvey Band supported Slade on their UK tour that year. Despite being a great band they were boo’d by the audience in every night. (Alex said before the Earls Court concert on 1 July 1973, with an audience of 18,000: “If the fans boo tonight, it’ll be the biggest boo that you ever hear”). No, we weren't, except for the first gig when we walked out in front of about 5,000 people in the Forest National in Brussels. Did you get the same sort of reaction on the European Tour – or were the European fans a bit more understanding to the support band? No, we were generally treated well by the audience. This was mainly due to the fact that we didn't stop rocking from the first minute to the last. Q. I hear that you were due to do an opening date with Slade in Iceland – but you didn’t appear on that night. What happened? There simply wasn't enough room on the plane so we didn't go. Slade's roadies had to sit on the equipment in a transport plane I think. Q. How long was your set on the tour? Can you remember any numbers you played? We did With a Little Help From My Friends every night and it went down really well. Q. Did you travel with the band to the gigs (the same flights) – or did you use you travel separately? In '73 we traveled with the band, but in '75 we had to travel in the Roadies van - it was a Mercedes and the side windows kept popping out - Europe is cold in November! When and how did you first come across Slade – did you hear about the band first – or was your first experience actually seeing them? At school in Derbyshire from 1962 to 1969 I was first introduced to pop music and became an avid fan of The Beatles. It helped that, as their music progressed, my teenage years moved on as well. In 1967 I was introduced to the music of, firstly, Blood Sweat and Tears; then Cream; then Family. The result was a seminal change in my attitude towards knowing musicianship from pop. I dropped out after a year, realising that I was actually only interested in being a journalist – and failing a succession of interviews. 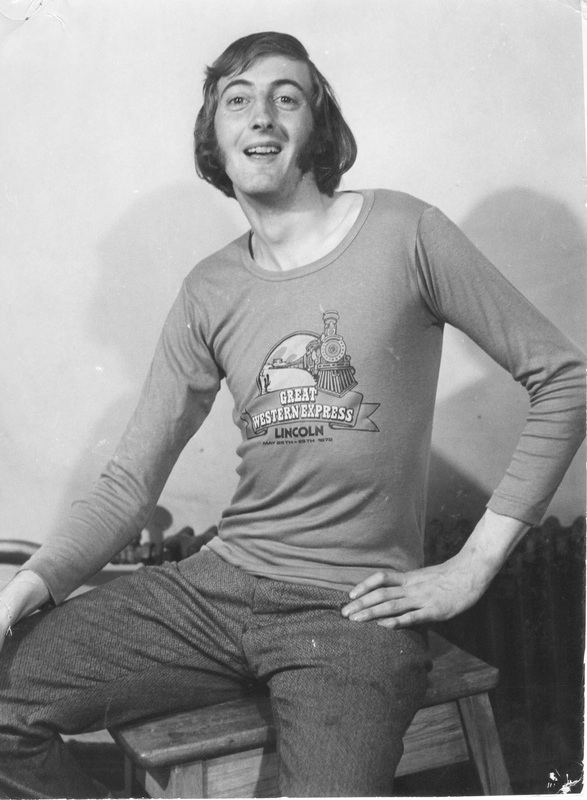 Eventually got as job at the Derby Evening Telegraph and started on September 21, 1970. The paper had a full page each Saturday on jazz, pop and folk music. 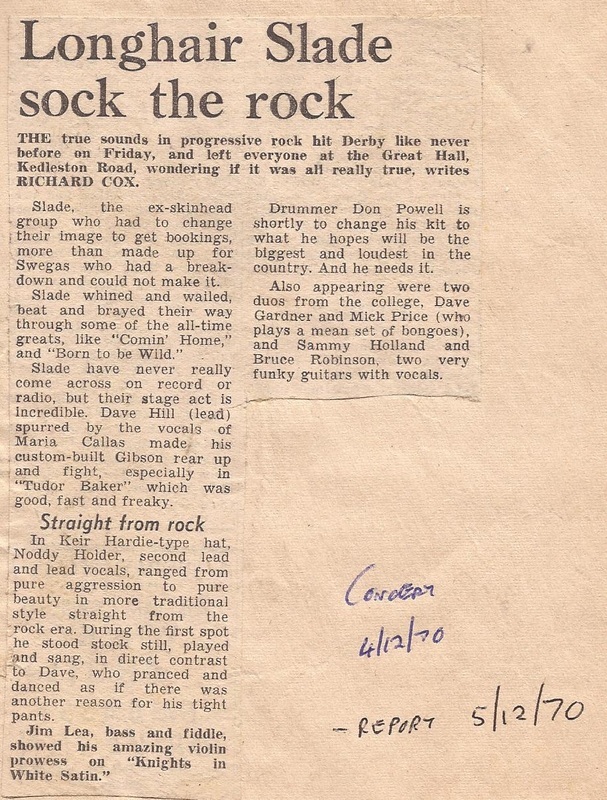 It had been started about a year previous because of the interest of two amazing people: Alan Smith, a sub-editor and jazz drummer, and Roy Hollingworth, who was a writer in love with late 60s rock and progressive. 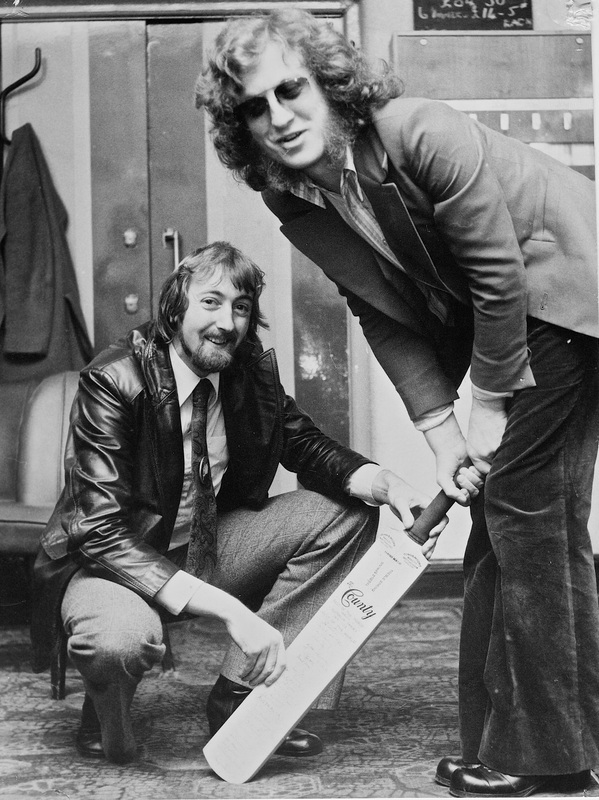 In 1970 Roy left for a job on Melody Maker and, when I joined, he was incredibly helpful, along with Alan, in getting me to understand and write knowledgeably about music – rock and jazz, mainly. Where did you see the band first? I was still 20-years-old and spending my days reviewing school plays, amateur dramatic societies, Magistrates’ Courts, and minor local newspaper things. In the evenings I was listening to music and discovering the delights of good beer. As the new member of the Saturday Page Crew I had to learn very quickly. My heart was with progressive rock; my head was absorbing many different kinds of music – some subtle, most dramatically different, such as mainstream jazz and bands like East of Eden. 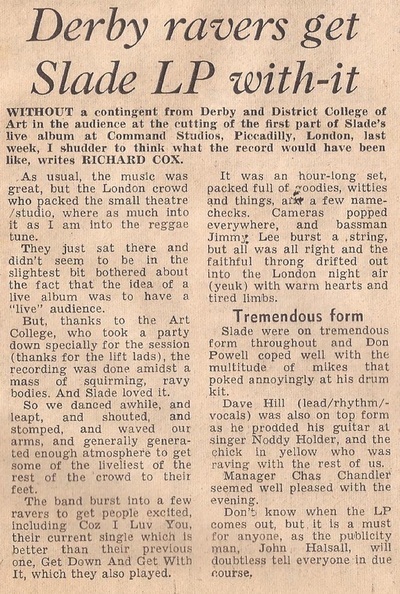 Slade were appearing at the Great Hall, Derby College of Art and Technology, a 60s-built glass and steel (ugly) building. I had been reading about the group’s transformation from The N’ Betweens through skinhead to a more heavy rock sound with underlying melodies. I was intrigued and not a little sceptical. I was heavily prejudiced against skinheads and the photos I’d seen of Slade tended to bear this out. The set was a revelation. The true sounds in progressive rock ’n roll hit Derby like never before on Friday, and left everyone at the Great Hall, Kedleston Road, wondering it was really true, writes RICHARD COX. 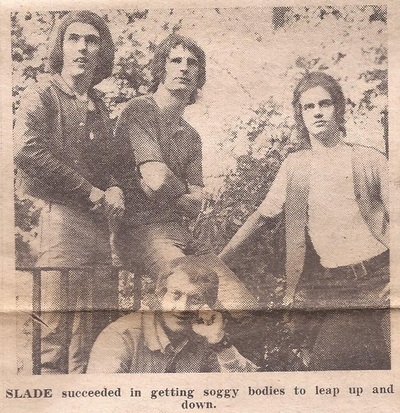 Slade, the ex-skinhead group who had to change their image to get bookings, more than made up for Swegas, who had a breakdown and could not make it. Slade whined and wailed, beat and brayed their way through some of the all-time greats, like Comin’ Home and Born to be Wild. Slade have never really come across on record or radio, but their stage act is incredible. Dave Hill (lead) spurred by the vocals Maria Callas, made his custom-built Gibson rear up and fight, especially in Tudor Baker, which was good fast and freaky. In Keir Hardie-type hat, Noddy Holder, second lead and lead vocals, ranged from pure aggression to pure beauty in more traditional style straight from the rock era. During the first spot he stood stock still, played and sang, in direct contrast to Dave, who pranced and danced as if there was another reason for his tight pants. Jim Lea, bass and fiddle, showed his amazing violin prowess on Knights in White Satin. Drummer Don Powell is shortly to change his kit to what he hopes will be the biggest and loudest in the country. He needs it." What was your initial impression of each of the members? As part of the reporter’s role I always went back to interview the band after the set. When this happened with Slade I was bowled over by their openness, friendliness, almost home-spun charm. The interview went out of the window. I cannot remember how it actually happened, but it may well have been an offer from Slade to give me a lift back to my grotty one-room bedsit near enough on the other side of the town. Whatever the reason, all five of us spent the early hours sitting on the floor next to my crackling gas fire talking about ... well, basically, five guys putting the world to rights. Don was always one massive smile. His whole reason for living, it seemed, was to be helpful and caring. He asked questions much more than talked about himself. The unspoken ‘leader’ of the group at that time. Noddy was also gregarious, welcoming, open and generous with himself (by that I mean he gave – opinions, compliments, concern, and views on semi-political things, such as how young people were treated in Britain). Quiet, but very relaxed and he seemed to enjoy the fellowship of the band. At this time, whilst he was accepted as the ‘musician’ of the band, this was not a matter of status: Jim’s attitude was that he was enjoying the band and he was convinced that they were going to be successful. Dave I seemed to gravitate to immediately as a mate. He was thoughtful and quite intense at times, but had a laugh and smile that enveloped the listener. He was fully aware that Slade were on the way up and quite straightforward about his belief that success was just moments away. Over the next few years I never heard Dave say one negative thing about anybody. Did you have much to do with Chas Chandler? Not really. I met Chas at various times, but he always seemed busy talking to other, older and probably more important people. 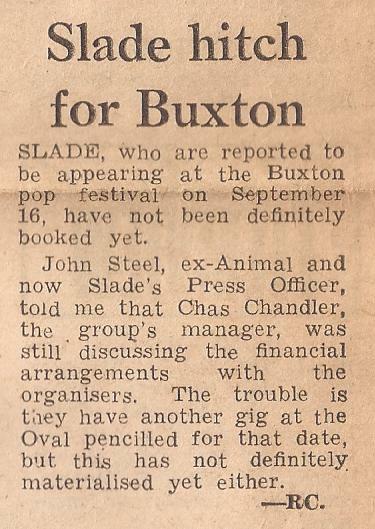 The only time I had a proper conversation with Chas was in February 1972 at Lanchester Arts Festival, where Slade were billed with Chuck Berry (where he recorded 'My Ding-A-Ling' I believe). No. I just used to turn up! The band left my name on the door if they knew I was going to turn up. As a journalist I would usually call the venue for the multi-band events and get a Press Pass. If I wanted to speak to Slade I would do so through Swin, who always made sure I was looked after and had free access. Don says that you as a journalist ‘supported the band right from the start’. Was this the case? Did you really think that the band could make it? 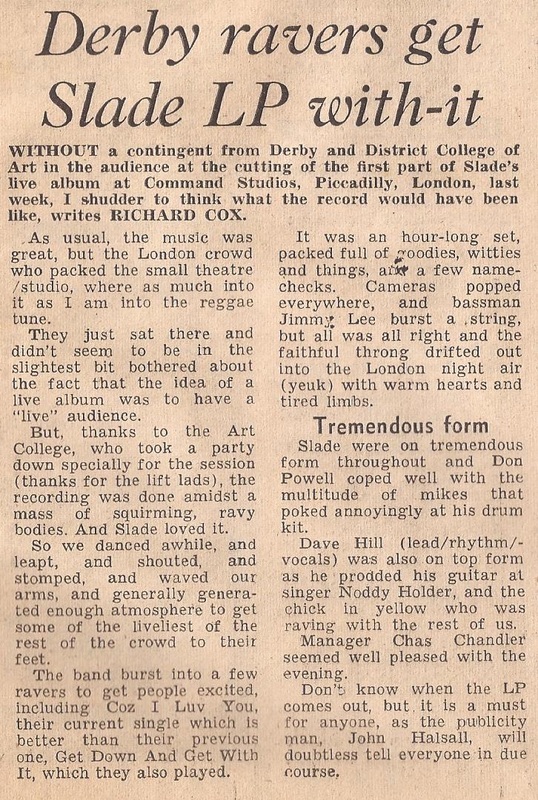 That first gig at Derby college was a moment of enlightenment. I knew then and there that Slade were going to be the biggest band in Britain, and soon. For some years I’d been steeped, as a listener, in the music of some exceptional groups and individuals, but Slade were different. 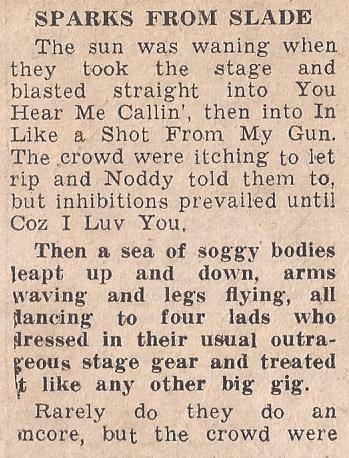 I’d seen and heard some great bands, playing great music, but none instilled the immediate response from an audience. There were several factors behind this, I believe. Musically they were loud and brash, but beneath it there was a melody that carried each number along. The drums, whilst loud, never out-shone the three guitars or Jim’s occasional violin, and the vocals were incredibly powerful, but understandable. Onstage presence 1. This was, for me, the golden age of music – mid/late 60s to mid 70s: based on a combination of my impressionable age, and the development of music from rock ‘n roll to total experience. Other bands would produce wonderful sounds, but they acted as if they were precious holders of a dark art. Slade used their guitars as instruments, not something to hide behind. Onstage presence 2. The competition were largely bands with a central figure (e.g. T Rex), where Slade had four different personalities on stage openly strutting their stuff. It reminded me a little of The Beatles in that there was no competition on stage, just four individuals acting as a single musical unit. Onstage presence 3. Dave Hill. I rest my case! He knew his role and he was not going to try and be cleverer, musically, than he needed to be. His job was flamboyance and a driving rhythm or lead. Onstage presence 4. Don Powell. He is tall, muscular, strong and any girls I was with took a shine to him ... in fact, to all the group. Where Don excelled was his ability to stay in the background physically, yet also be the centre of attention because of his dexterity and power. 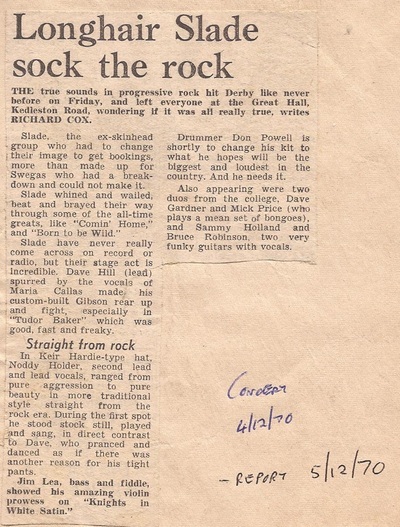 Many drummers at that time were aware of their role in keeping time; Don used his drum kit to draw audible pictures without hogging the limelight. Noddy Holder’s voice. There have been many great vocalists in rock bands (e.g. 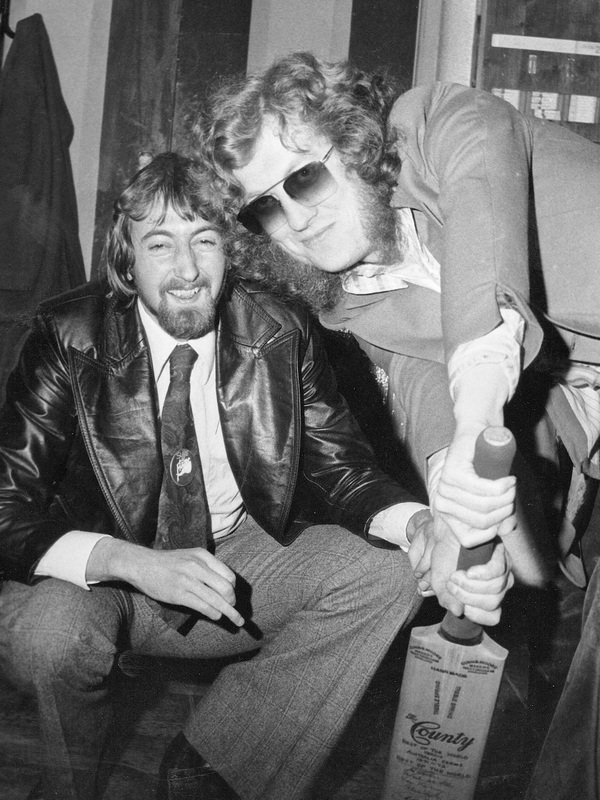 Blood Sweat and Tears, Family, The Beatles, Stones, Kinks), but few as good as Robert Plant or Noddy Holder. Those two were distinctive, but had a tremendous range of styles. Noddy was not constrained by a format that clearly worked: he was always keen to stretch the boundaries. Jim Lea’s musicianship. His training and virtuosity are now well-known, but in the early 70s that was not publicised. However, it was apparent from the beginning that Jim was able to drive the band forward and set Slade apart from the hundreds of four-piece groups who had a similar line-up – drums, lead, rhythm and bass. His expertise did not compete with the more basic skills of the others, rather it magnified the overall togetherness of the complete sound. Back to the initial question. Yes. I was convinced and an immediate believer, even though I was immersed in the national and international music scene, that Slade were going to be massive. They had all the above attributes on show the first time I saw them, and then they just kept getting better. Did you actually get to meet / know the band personally? How did that happen? Did you become aware that Slade themselves were reading your reviews of their gigs and were appreciative of your comments? No. Never. They would occasionally mention a review or comment I’d written, but I always thought that this was hand-delivered by their publicist or just politeness! If it’s true I am knocked out and honoured, as well as being slightly embarrassed by some of the juvenile writings of my early 20's. How many times in all did you see the band live? What was their best performance that you saw? This was a massive, cerebral, prog rock event and the crowd seemed to be dismissive of Slade. Pre-set the band were more thoughtful than normal and there was some collective tension. Then, with a few bars, they had a field full of music fans on their feet and bopping. Finally, for Nod to bring the event organisers on stage was a master stroke. Plus, in the Slade caravan pre-set, I was ‘attacked’ by a drunk and very affectionate Julie Ege, the actress. Perfect body and most of it was on show for eyes and my hands! We went outside and danced like dervishes for the Slade set. Much champagne had been taken. Very hazy memory of getting back to Lincoln railway station. What satisfaction did you get when the band actually made it? By October 1971 I considered myself a friend of the band, and it was well-known within the office that we were on mutual first name terms. I asked for, and was given, a silver single of their first No 1, which was then auctioned for charity by the newspaper. I now wish I’d asked for one for me! The result of that first No 1 and the subsequent chain of success was a massive boost to my ego. Strangely I managed to secure more romantic interludes on the back of knowing Slade than would normally be possible for a not very good looking bloke! To be brutally honest though, my real satisfaction was simply in seeing them reach the heights I always knew they were capable of. My reviews of their concerts were much better and more involved after that first one. After the band made it and were having No1s – did you actually still get to see the band? Unfortunately I was constrained from seeing them as much as I’d like by: 1. The fact that I had a ‘proper’ job at the newspaper; 2. I was a poorly paid reporter; and 3. They cleared off the America and on worldwide tours. What did you feel about the band’s image changing from when you first saw them, and them going down the ‘glam’ route? The ‘Glam Rock’ image was good in that it reflected the adoration/adulation of the fan base that seemed to be young and split male/female. Whilst I was not a fan of too much glitter myself, I felt that it was done by Slade in the right way. This was blatant showmanship and designed to set them apart – and it worked. What was your impression of Slade compared to their ‘glam’ rivals: T.Rex / Sweet / Gary Glitter? I felt, and still do, that Slade were using Glam for their own ends. Their musical ability and stage presence set them apart from the other ‘glam’ bands. I never liked the Glitter Band (retrograde and ‘slab’ music), nor Sweet or Mud (not technically as musical, nor with the big stage presence). I thought T.Rex were innovative, but their style was stuck behind the limited vocal range of Marc Bolan. Did you actually own any of the band’s records (it’s ok to say if you didn’t!)? Every album from 1971 to 1976 – and I still have them. Several personally signed by all four. Slade In Flame movie? What are your thoughts? Did you see it at the time of release? I also have the book of the film – signed. The film was OK. 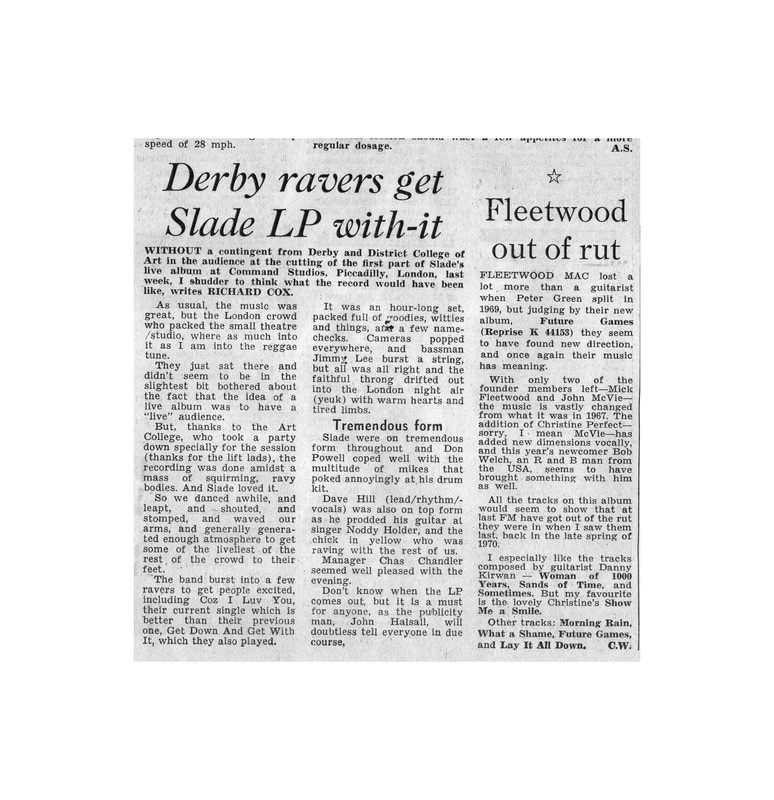 In the great panoply of movie history it’s not going to reap a field of Oscars or BAFTAs, but it was made at a time when the right strategy was to massively increase Slade’s presence. It was, in fact, a well made film and Slade themselves took their acting roles seriously and moved the plot along very well. The soundtrack was exceptional. It is a collection of some of the best and most mature tracks Slade ever laid down, in my opinion. 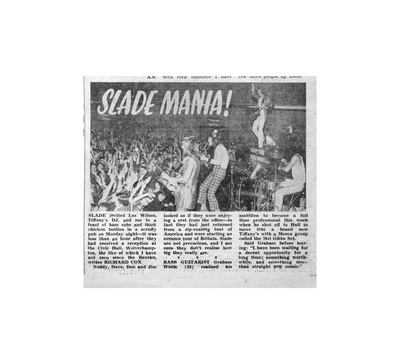 I firmly believe that if Slade had stayed in the UK a little more they would have become one of the great ‘stadium’ bands of the late '70's and '80's. Between 1975-1977 Slade ‘emigrated’ to the USA? What were your thoughts on this? This coincided with a difficult time for me at work. I felt that I was not getting any further as a journalist; I questioned my constant involvement in covering music, and I began to get a real buzz out of other elements of newspaper reporting; and I was drinking too much, had a few relationships that went wrong, and was permanently broke. I was always interested in Slade and loved their music, but they were physically not here. When Slade returned from the US they went back to the grass roots and toured the small clubs again. Did you catch them at this stage? In 1978 I moved to the Nottingham Evening Post and the pressure of work took over. I focussed on being a good journalist and within a year I’d been appointed a sub-editor, and then, in 1981, Business Editor. These years were very high pressure and I’d just got married (and that one was a failure – thank God!). So no, Slade and I drifted apart. I always regretted that and would love to meet them all, probably individually as they all lead different lives. Did you think the band would make it again? With the original line-up I had every hope that Jim and Nod would write something really exceptional. I since know that inter-band relationships were not good, certainly not as good as the impressions I’d picked up in the early 70s. What had amazed me was that four totally different guys, who’d been playing together since the '60's, could still be mates and colleagues 20 years later. My first marriage only lasted seven years – and I slept with her! Slade was a working relationship and the vast majority of those change, move focus and break up within a few years. They seemed so solid and together. Noddy leaving was always going to happen. He put his voice through extremes with some songs and something had to give. Jim leaving was also a natural movement. His skills and talents surpassed the rigours of a standard, successful set and he was always going to need to move on. Best Slade song they performed live? Can you give me some funny stories about some of your Slade experiences? 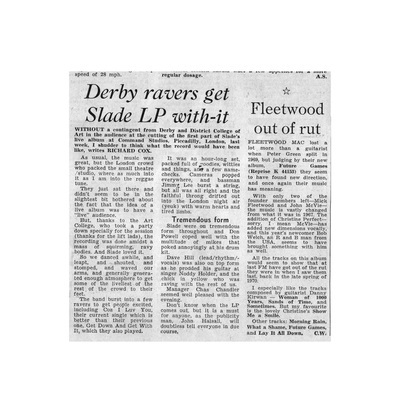 Well, one was when H and Nod came to Derby for a Slade in Flame chat and for some reason the Sports Editor organised it for The Grandstand Hotel at Derbyshire County Cricket Club. I know not why ... and neither does he. We were joined by my journalistic and musical mentor, Alan Smith, and a girl reporter who was hanging about with me coz she wanted to meet Slade. 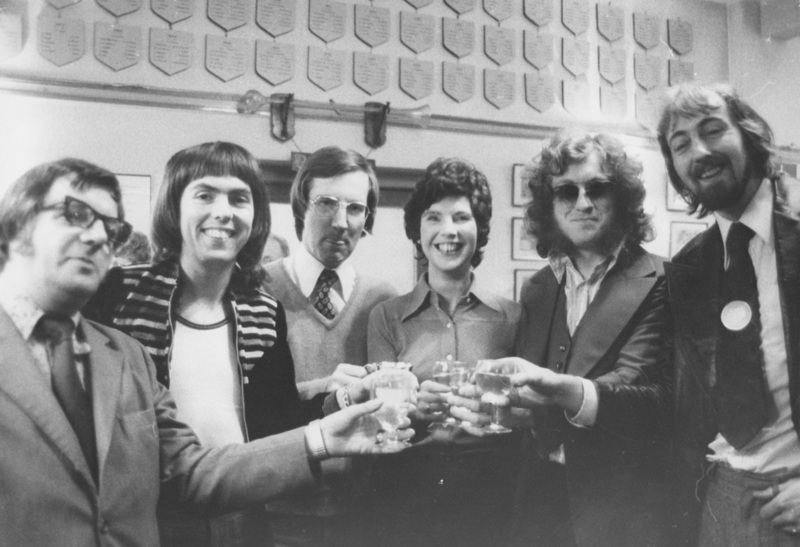 Afterwards Slade had to go back to Birmingham (Pebble Mill) for a BBC radio interview. Nod went in the proper car. H came in this woman reporter’s car (Lynne Horne she was). I drove and she sat on Dave’s knee for the entire journey! She says he was a ‘perfect gentleman’!? Also another story is whilst we were very close, I was still a newspaper reporter and, as such, would be reporting on things they did. This means that they were probably a lot more restrained in my company. Plus, I normally saw them before a gig (serious preparation time) or immediately afterwards (knackered and sweaty). 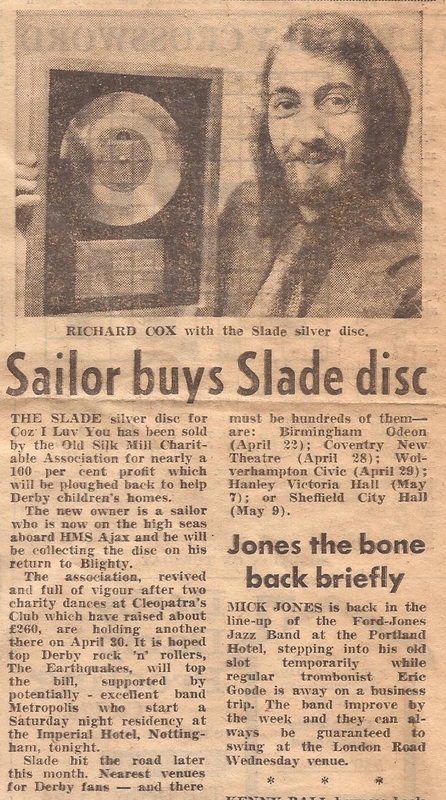 The only other one I can think of, which might raise the jealously stakes among current fans of Slade, is that I was invited by the group and Chas to the home-coming gig at Wolverhampton. I bummed a lift with a friend and DJ from Derby. 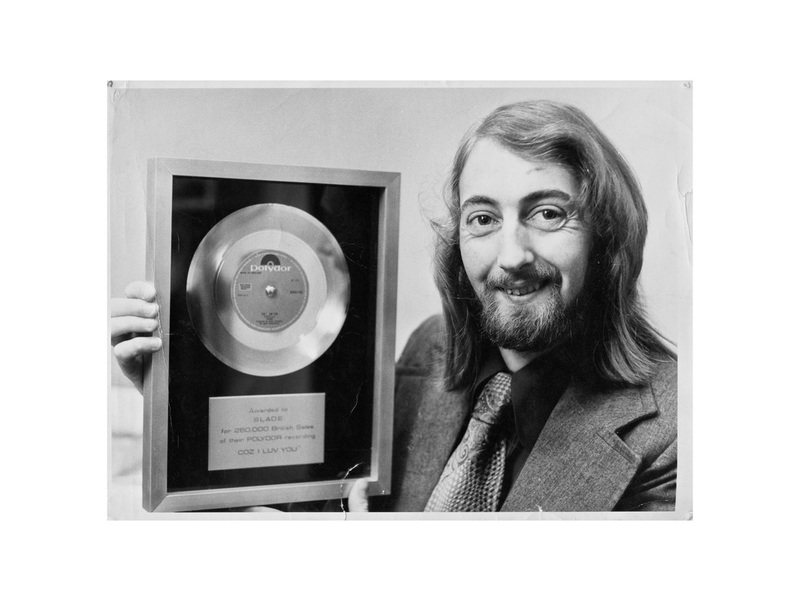 We mixed with all the hoi polloi of the record industry and I remember speaking to Keith Altham at some length. I was pretty much in awe of the guy. After the set we were both invited back stage. All the VIPs went to The Trumpet in the ‘official’ transport, but we stayed behind a little. When the band was ready Swin told us that there were hundreds of fans outside and they would have to ‘run the gauntlet’ to get to the limousines. Swin, with Dave’s agreement, gave us each a guitar and all of us ran through a baying mob and dived into the, I think, Daimlers. It was an amazing experience, but the memory has been befuddled by time and the amount we had to drink when we arrived at The Trumpet.